Perhaps the most interesting and potentially far reaching legal case in Europe this year is the proposed complaint by four German professors to the Federal German Constitutional Court at Karlsruhe (Bundesverfassungsgericht) to prevent a German contribution to the European Union /IMF aid package for Greece. The Constitutional Court is the closest equivalent in Germany to the UK Supreme Court. It is reported that the case will be filed on Friday. If the case were to be successful, the aid package would almost certainly be blocked instigating one of the gravest crises in European Union and indeed European financial history. However, the legal merits of the claim do not look too good. The complaint which it is said will be filed in the next couple of weeks is based on three main legal arguments. 1. The aid package is alleged to be a violation of Article 125 of the Lisbon Treaty which states that “a Member State shall not be liable for or assume the commitments of central governments … of another Member State …”. The current plans of European governments including the German government would – it is claimed – be a breach of this provision. In 1993, in a key judgment handed down by the Court in relation to the Maastricht Treaty, Article 125 was held as a central element to secure the concept of a monetary union within the EU. If the principles established in Article 125 are now breached, it can be argued that the German consent to join the monetary union itself is invalid. 2. The planned measures to support the Greek government – it is claimed – constitute illegitimate state aid as the rates of interest for the promised loans are below regular market rates. As it will be mainly financial institutions that will indirectly profit from the loans given to the Greek government they would have an undue advantage compared to other market parties in the EU. If this argument is correct, a potential German act of parliament which the German government plans to adopt in order formally to approve the help for Greece would be illegitimate and could ultimately be declared invalid. 3. Finally it is alleged that the aid package is a violation of article 14 of the German Constitution (Guarantee of Property Rights – Eigentumsgarantie) and that the German contribution to it would endanger the stability of the German economy and would aggravate the danger of inflation. This would directly affect savings and pension claims of every German citizen. Regardless of the merits of these individual arguments, the professors face a more difficult legal obstacle to their claim. They have to justify why a group of citizens should be entitled to file a constitutional complaint against a political decision of the government which might only affect them in a very indirect way if at all. The Federal Constitutional Court of Germany is mainly responsible for judicial review but does not serve as a regular appellate court for the violation of federal laws. Its jurisdiction is focused on constitutional issues, the integrity of the German Constitution (Grundgesetz) and the immediate compliance of governmental institutions. There are different defined types of procedures at the Constitutional Court, most of which can only be initiated by political institutions, for example a Federal State, the German Parliament (Bundestag) or members of the Parliament. It is only a constitutional complaint which can be filed by any person alleging that his or her constitutional rights were violated by a legal act. In order to be entitled to file a complaint, the legal act has to affect the petitioner personally, directly and at present. It will be difficult for the professors to fulfil these requirements and it will need a very elaborate rationale to justify the complaint. Article 125 may be affected by the EU/ IMF aid package but it is hard to see how this potential violation would affect German citizens personally and directly. Furthermore the European governments involved in the initiative do not claim to base their actions on EU law competences. As for the potential violation of national or European state aid regulations – the four professors do not claim to be disadvantaged in their business and there is no other obvious effect on them. Finally, they might be affected by inflation and economic instability but those proclaimed dangers of the aid package are rather vague and do not obviously have the potential significantly to affect individual citizens at present. The four professors are eminent law professor, Albrecht Schachtschneider, former member of the central bank council and professor of economics Wilhelm Nölling as well as Joachim Starbatty, and Wilhelm Hankel who both hold a chair for economic sciences. The four are all known for their scepticism about the euro and unsuccessfully tried to take legal action against the implementation of the euro in Germany in 1998. In view of the impact of the financial crisis on monetary stability in Europe, the professors see their opinion that the euro was “the worst mistake in the history of monetary policy” vindicated. 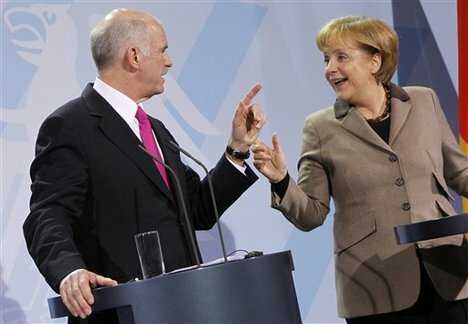 Their current attempt to prevent a German contribution to the financial support of the Greek government reflects the wide-spread public criticism of the German government’s general willingness to offer up to 8.4 billion euro in loans as part of the EU/IMF aid package. So while the financial aid for Greek gives rise to interesting questions of European and national constitutional law and will certainly be intensely discussed on a political level and while this case will cause unwelcome uncertainty in the markets and in the capitals of Europe, in the final reckoning, it is unlikely that it will be the four professors from Germany who will stop the EU/IMF aid package and the German contribution to it. The Daily Telegraph has a report here. Leave a reply on "Euro sceptics to challenge Greek financial aid at Germany’s Constitutional Court"